Mutards can have multiple mutations, from those almost indistinguishable from a normal human being, to those clearly visible. Most of them are, nonetheless, quite disgusting. 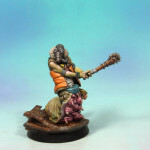 This miniature has been modelled by Leonardo Escovar and painted by the Big Child Creatives crew. It is equipped with a Mace and the Sure feet mutation.